Jacques Peter Smart and other KuC students found hundreds of dead blackfish in one of Arthur Dull Lake's many tributaries. Credit Courtesy of Jacques Peter Smart. Last Monday, Jacques Peter Smart walked through the snow to a creek in downtown Bethel, a shallow tributary from Arthur Dull Lake that runs aboveground between Sixth and Seventh Avenue. Hundreds of dead fish were curled together at the bottom of the rust-colored creek bed, each small enough to fit in your hand. "We’re looking at a bunch of dead blackfish that washed out of Dull Lake," Smart said. "It happened over a period of three to seven days, but it kind of totally happened overnight, and we were shook by it." 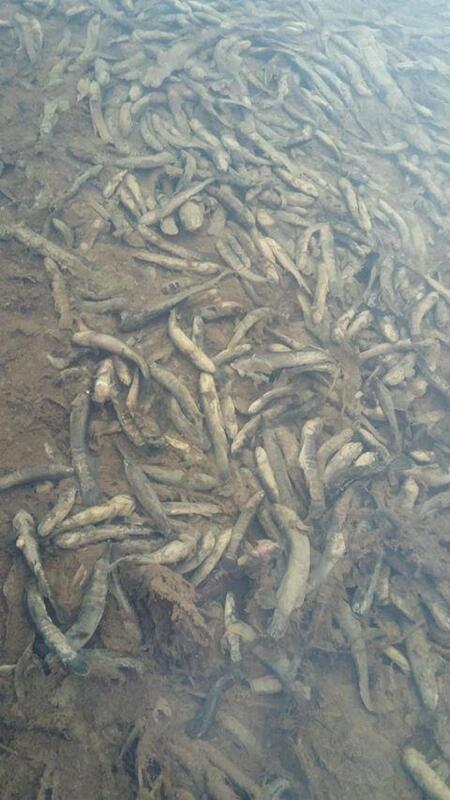 There are at least 500 to 1,000 fish here, Smart said, and he suspects that some have washed downstream as well. Originally from Nunapitchuk, Smart studies Information Technology at the University of Alaska Fairbanks’ Kuskokwim Campus. The program is a lot of work, so a few months ago, Smart and a half dozen other students started fishing the Kuskokwim together to unwind. They bait their hooks with blackfish, and set several traps for them in Bethel's streams and lakes. Smart started finding dead fish in his trap near Dull Lake about two or three weeks ago. Now, there are hundreds and hundreds of them. He posted about the die off on Facebook on November 11, and last Friday the Orutsararmiut Native Council (ONC) decided to get involved. "We haven’t seen this before," said Mary Matthias, ONC's Environmental Coordinator. "So there's something in the water. I mean, someone’s putting something in the lake." Matthias said that the fish were most likely killed or disfigured by pollution. The culprit could be a chemical leak from a local business, an accidental spill, or run-of-the-mill littering. "You know, within this past year I’ve seen batteries stationed right outside of the dumpster on the ground instead of getting recycled," said Matthias. She added that discarded electronics and fuel can also have this effect on animals living in the water. Other Bethel waterways could also be polluted. Smart said that his friends are catching healthy fish in their trap near BIA Road, but Matthias said that on Saturday, Bethel resident Richard Robb reported catching a discolored, disfigured fish near Tundra Ridge. It’s not clear if the two incidents are connected. Of course, there’s a chance that the blackfish weren’t killed by pollution at all. In a series of Facebook messages this morning, Jacques Peter Smart told KYUK that one of his friends reported the die off to the Alaska Department of Fish and Game. The agency told him that it wasn’t a die off at all. According to the Fish and Game representative, Smart writes, a local fisherman forgot to check their blackfish trap and may have dumped the dead fish in Dull Lake. KYUK is working to independently confirm this allegation. To assess whether the blackfish were killed by pollution, Mary Matthias plans to retrieve water samples from Dull Lake and send them to Anchorage or the Yukon-Kuskokwim Health Corporation for further testing. She also notified Association of Village Council Presidents personnel of the problem and called the city’s Public Works Committee to see if they could help. As of this reporting, she said they had yet to call her back. For his part, Smart is looking into grants offered by Alaska’s Department of Environmental Conservation, or DEC, which provides funding for municipalities that are trying to address water contamination and treatment. In an email exchange on Tuesday, spokeswoman Candice Barber said that the DEC had not received any reports of an apparent die off in Dull Lake. She declined to comment further on the incident until the DEC had more information. Correction: A previous version of this article stated that the DEC declined to respond to KYUK’s requests for comment. In fact, DEC spokeswoman Candice Barber responded promptly to KYUK's request but declined to comment on Dull Lake's apparent blackfish die off, as the DEC had not received sufficient information about the incident. We regret the error.